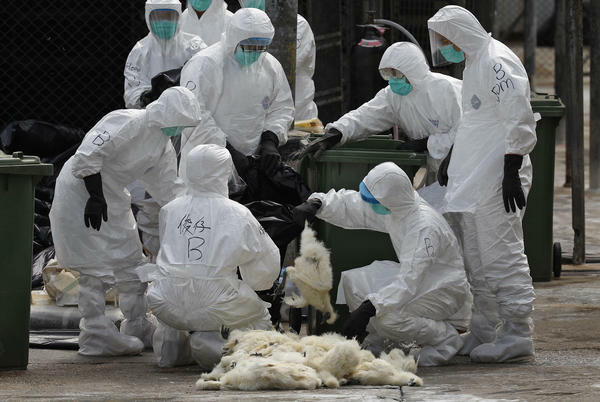 Health workers killed chickens in a Hong Kong market in 2014 in an effort to stop the spread of H7N9 flu. It's being watched closely as a virus that might spark a pandemic outbreak. Scientists could soon resume controversial experiments on germs with the potential to cause pandemics, as government officials have decided to finally lift an unusual three-year moratorium on federal funding for the work. The research involves three viruses — influenza, SARS, and MERS — that could kill millions if they mutated in a way that let the germs spread quickly among people. The bird flu virus H7N9, for example, is known to have infected more than 1,500 people, and 40 percent of them died. But unlike common flu strains, this one does not spread easily among humans. Biologists say they may need to alter these viruses in the lab to understand what genetic changes matter in starting pandemics, so they can understand the risks and get ready. But some of their past efforts to tinker with viruses have made other scientists uneasy. On Tuesday, the Department of Health and Human Services released a new framework for making decisions about funding research that has the potential to create a new pandemic strain. "We have a responsibility to ensure that research with infectious agents is conducted responsibly, and that we consider the potential biosafety and biosecurity risks associated with such research," said Francis Collins, director of the National Institutes of Health, in a statement. The move by officials may mark the end of a long saga that has sharply divided the scientific community in recent years. In 2011, scientists revealed that they had deliberately made forms of a deadly bird flu that could transmit easily among ferrets, the stand-in for people in flu studies. Critics argued that the knowledge gained wasn't worth the danger of creating a superflu that might escape the lab. In early 2012, virologists agreed to put a voluntary moratorium on their bird flu work that was supposed to last only 60 days, but ended up lasting more than a year. The issue flared up again after unrelated mishaps involving anthrax and bird flu heightened concerns about lab accidents. At about the same time, the Ebola outbreak provided a vivid example of how a deadly, contagious virus could kill thousands. In October 2014, the White House announced a mandatory "funding pause" for any research that could make influenza, severe acute respiratory syndrome or Middle East Respiratory Syndrome more deadly or more transmissible. Officials embarked on an effort to come up with a regulatory process that would weigh the risks and the benefits of experiments, with input from the National Science Advisory Board for Biosecurity and the National Academies of Sciences, Engineering, and Medicine. "There has been increased scrutiny of laboratories working in this area, which can lead to an even more robust culture of safety. But I also fear that the moratorium may have delayed vital research," says Samuel Stanley, president of Stony Brook University and chair of the NSABB, who said he was not speaking for the biosecurity committee. "That could have long lasting effects on the field. I believe nature is the ultimate bioterrorist and we need to do all we can to stay one step ahead." Indeed, as the moratorium dragged on, some scientists wondered whether this research would end up being done by labs overseas that weren't subject to these funding restrictions. "I am happy to see that this is finally moving forward," says virologist Ron Fouchier of Erasmus Medical Center in the Netherlands, whose NIH-funded experiments with bird flu originally sparked this debate. He said he has not seen details of the review process, so he does not know exactly what it would mean for the research community. But he was hoping to resubmit proposals that had been approved under the old policy "and continue with the NIH-funded research activities that have been on hold for several years now." Matthew Frieman, a virologist at the University of Maryland School of Medicine who studies SARS and MERS, is also "thankful this is finally resolved." He says there has been "much uncertainty" among researchers working on these pathogens. "It is very good news for laboratories interested in understanding the threat of natural pathogens to the human population," agrees James Paulson, a researcher at The Scripps Research Institute. He believes that the new review process will allow responsible research to move forward "while guarding against the creation of pathogens with pandemic potential." He says his team will likely apply for approval to study the potential for certain mutations to increase how easily bird flu can be transmitted among humans, but they would study the effect of these genetic changes in weakened flu viruses and not the deadly H7N9 virus itself. Scientists could soon go back to conducting controversial experiments on deadly viruses like bird flu. Government officials put a hold on this kind of work three years ago, and now that ban has been lifted. NPR's Nell Greenfieldboyce is here to explain why this research was stopped in the first place and what might happen next. Hi, Nell. SHAPIRO: Why was this research stopped in the first place? GREENFIELDBOYCE: All right, first you got to understand what this research is all about. Basically there are these animal viruses out there like influenza - infects birds and things. And sometimes these viruses jump into people and start spreading and cause a global pandemic. And scientists want to understand what threats are out there in nature and what kind of changes in the viruses might make them start a global outbreak in humans. And as part of that, what they want to do is sort of tinker with the viruses in the lab to see what they're capable of. Now, in 2011, scientists announced that they'd taken a deadly bird flu virus and changed it in the lab in a way that it turns out made it transmissible - so contagious through the air between ferrets, which are the laboratory stand-in for people in these flu experiments. And so what that meant is basically they'd taken a flu virus that up till then out in nature hadn't been spreading between people like regular flu, and they changed it in a way that possibly made it capable of doing that. I mean, critics looked at this and said, you have just created a super-flu. Thank you very much. GREENFIELDBOYCE: You have now just deliberately created the very thing that we are scared of. SHAPIRO: I've definitely seen apocalyptic movies that began this way. So is this the reason that these kinds of tests were put on hold? GREENFIELDBOYCE: Exactly. And so some people said the benefits that we're getting from this research just aren't worth that risk. Now, you should know that the scientific community is split on this. I mean, scientists literally formed two groups that were, like, signing petitions and some saying this research needs to go forward. Others say it's just too dangerous. And so people couldn't seem to agree on the risks and benefits. And this debate has gone on for years. There was a voluntary moratorium that the scientists agreed to for a while, but then the research continued. And then in 2014, a couple strange things happened. There were some unrelated lab mishaps where there were accidents involving anthrax. And you know, smallpox turned up in a place it wasn't supposed to be. SHAPIRO: Yeah, I remember those. GREENFIELDBOYCE: And at the same time, you had the Ebola outbreak providing this, you know, vivid picture of what an unconstrained deadly virus can actually do. So in 2014, the White House said, whoa, we're going to put a stop to this research - any kind of research with influenza or two other viruses, SARS or MERS, that could potentially make those things more dangerous. And we're just going to stop and think about this and straighten it out. SHAPIRO: So they spent three years thinking about this, and today they've announced a new standard for deciding when these kinds of tests should be allowed. What is that standard? GREENFIELDBOYCE: Well, it's really more of a process. It's a process for having a committee review of the potential risks and benefits of any proposed experiment. And so what they're going to look at is, you know, what are the real benefits to doing this? What knowledge will be gained? Is it important for public health? And is there any safer way to get that same knowledge that we could pursue instead of these risky experiments? And some scientists are really pleased with this. They think finally the uncertainty they've been under for years is over, and now they know how they can make proposals and see if they can do the work. SHAPIRO: Do you think this is going to satisfy the critics? GREENFIELDBOYCE: I don't think so because it's impossible to tell at the moment what experiments are going to be allowed. The framework doesn't, you know, set a clear red line about what's acceptable and what's not, and a lot of this is going to come down to judgments about risks and benefits. And people are going to disagree about that. So I think we have to wait and see how the language of this new plan gets put into real life and to see what kinds of experiments are allowed to go forward and what kind of experiments are denied. I would not be surprised if in a couple of years we will sit together and talk about some experiment that has made some people very uncomfortable. SHAPIRO: Well, I hope we get to talk before then, too. That's NPR's Nell Greenfieldboyce. Thanks a lot. GREENFIELDBOYCE: Thank you. Transcript provided by NPR, Copyright NPR.